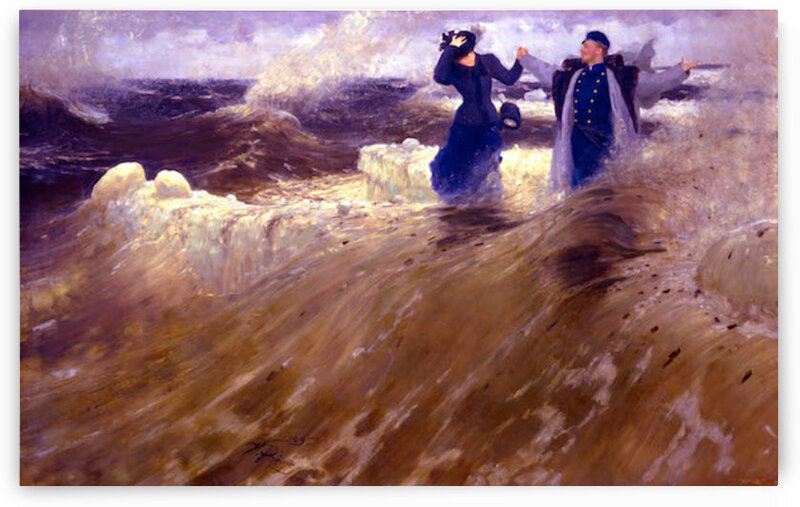 Ilya Yefimovich Repin (Russian: , tr. Ilya Yefimovich Repin; Finnish: Ilja Jefimovitš Repin; 5 August [O.S. 24 July] 1844 – 29 September 1930) was a Russian realist painter. He was the most renowned Russian artist of the 19th century, when his position in the world of art was comparable to that of Leo Tolstoy in literature. He played a major role in bringing Russian art into the mainstream of European culture. His major works include Barge Haulers on the Volga (1873), Religious Procession in Kursk Province (1883) and Reply of the Zaporozhian Cossacks (1880–91). Repin was born in Chuguyev, in Kharkov Governorate, Ukraine (Russian Empire at that time) into a family of "military settlers". His father traded horses and his grandmother ran an inn. He entered military school to study surveying. Soon after the surveying course was cancelled, his father helped Repin to become an apprentice with Ivan Bunakov, a local icon painter, where he restored old icons and painted portraits of local notables through commissions. In 1863 he went to St. Petersburg Art Academy to study painting but had to enter Ivan Kramskoi preparatory school first. He met fellow artist Ivan Kramskoi and the critic Vladimir Stasov during the 1860s, and his wife, Vera Shevtsova in 1872 (they remained married for ten years). In 1874–1876 he showed at the Salon in Paris and at the exhibitions of the Itinerants Society in Saint Petersburg. He was awarded the title of academician in 1876.